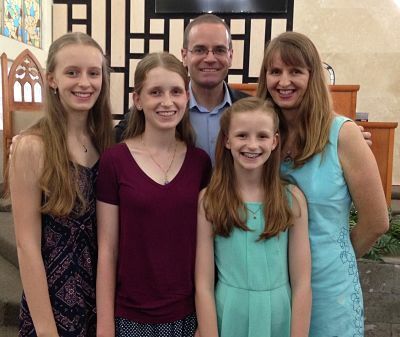 The Charles family are CMS missionaries based in Santiago, the capital of Chile. Santiago is a densely populated metropolis of 6 million people nestled among the foothills of the Andes mountains. Michael and Jo have been serving the Anglican church of Chile since 2004. The Anglican church is quite small, numbering less than 5,000 members in a country of 17,000,000 people. Approximately 75% of Chileans identify as Roman Catholic, with another 15% as Protestant. Michael is Acting Principal of the Centro de Estudios Pastorales (CEP), which is the seminary of the Anglican church of Chile where he teaches New Testament, Old Testament and Greek, as well as delivering occasional Bible seminars and sermons. Jo teaches Biblical Counselling, works with CEP women, teaches weekend seminars, counsels and reads the Bible with women. Since the CEP began in 2003, over 80 students have studied full-time with another 50 or so studying various part-time courses. More than half the graduates have gone into full-time ministry including more than 30 ordained clergy, mainly in Chile. CEP is the only Anglican seminary in the Province of South America. It has received students from Chile, Northern Argentina, Peru, Bolivia and Paraguay. One of the great joys of serving at the CEP has been seeing graduates not only flourish in ministry, but also train up and send more students keen to serve the Lord Jesus and his people. This has resulted in a church that is more Biblically solid, self-sustaining and committed to seeing a world that knows Jesus, not just as Saviour, but more importantly, as Lord. The Sholl family are missionaries with CMS-Australia and have lived in Monterrey, México since 2009. Peter leads MOCLAM, a ministry that aims to support local churches throughout the Spanish-speaking world, by offering theological education by distance. Many pastors and church leaders in Latin America don't have formal theological education, so MOCLAM offers them materials they can study in their local context. Peter’s job takes him all over the Spanish-speaking world, to teach courses, speak at conferences and encourage current and emerging local church leaders. In 1998, Peter and Sarah founded the Inner West Bible Fellowship, the congregation that is now St Matthew’s Ashbury. Warwick, Lauren, Lilly, Arin and Scarlett serving in Liberia. Compassion enables churches like ours to care for 1.8 million sponsor children in the developing world. For 65 years, Compassion has been releasing children from poverty in Jesus’ name through the prayers and financial support of Christians in Australia and other developed countries. In response to God’s call Compassion gives hope to the hopeless, sharing the gospel of Jesus Christ in a culturally relevant, non-coercive way. While Compassion is a distinctly Christian organisation, they assist children and their families living in poverty regardless of their beliefs, gender or background. Compassion’s Child Sponsorship Program is the only child sponsorship program validated as effective through independent, empirical research. On average, a Compassion sponsor child spends 4,000 hours in safe, nurturing programs, is at least 50 percent more likely to graduate from university and is 35 percent more likely to find white-collar employment as an adult. Compassion’s response to a world in need filled with millions of children living in poverty is simple: Love like Jesus did. Serve in Jesus’ name.